If first impressions last, then NinjaOutreach should have been doomed by our bungled product marketing long ago. 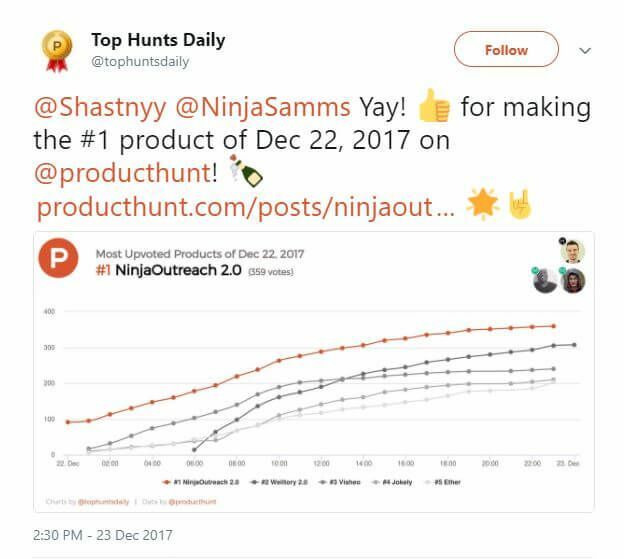 We first launched NinjaOutreach on Product Hunt—a popular app curation and discovery platform—in 2014. I wasn’t part of the team yet at the time, but our founder, Dave Schneider, did admit the launch could have gone better. Granted, we still managed to get featured as #10 on Product Hunt’s homepage—and on our first attempt at that. Fast forward to 2018, with new team members, a significant rebranding, fresh look, and copy, we relaunched NinjaOutreach version 2.0. And this time around, even with a small team and a low-budget product marketing strategy, we made it to #1 on Product Hunt’s homepage. We eventually ended the day at #2, but compared to our previous rank of #10, that was a significant jump! Of course, we didn’t achieve all of this without a plan. And in this article, we’ll share our product marketing strategy for how we made our comeback and reached #1 on Product Hunt. Such was the comment of one unimpressed user who never made it past his trial period. Despite those harsh words, we couldn’t deny that although we had more customers than most of our competitors, we were definitely behind when compared to their sleeker designs, cohesive branding + content, and smoother UI. Ultimately, this lack of harmonious branding, coupled with clunky UX both in-app and on the website failed to adequately convey the true value and functionality of our tool. Also confirming this theory was an in-depth study from a firm Dave hired, which found that potential customers rated us low in trustworthiness. Apparently, this was because (surprise, surprise) they didn’t find our “look” particularly trustworthy. Fortuitously, this came at a time when I, along with our Head Copywriter, Daphnie Loong, was already pushing (short of nagging) the team for a redesign. And with all the new supporting evidence, the ball was in our court. It was time make the shift, and we were finally ready to give NinjaOutreach its badly needed makeover. The rebranding was a monumental effort that led to monumental changes. 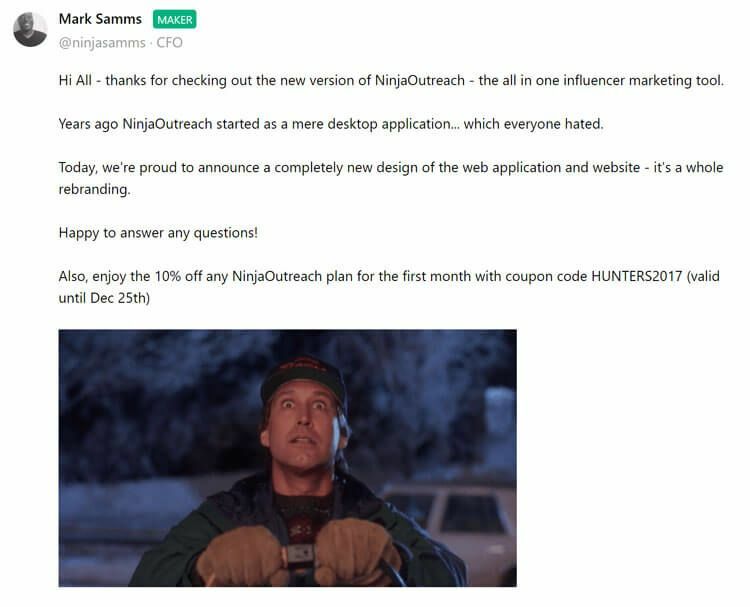 Save for the official business name, everything about NinjaOutreach changed. And not just changed, but taken to a whole new level. 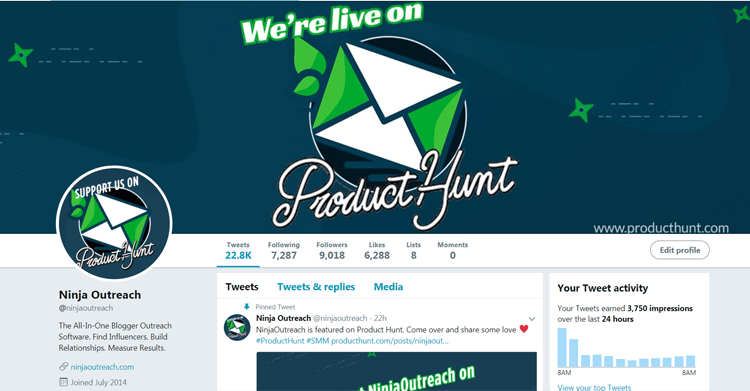 Excited to spread the word about these upgrades, Dave and the marketing team thought it would be a good idea to relaunch NinjaOutreach on Product Hunt. So, our Asset Manager Evgen Schastnyy assembled a small team, and with the guidance of Dave and our co-founder Mark Samms, operation Product Hunt Comeback was set in motion. For the uninitiated, Product Hunt is an online community, app curation, and discovery platform where users share app news and recommendations with each other. It’s essentially like a Quora or Reddit for apps, where apps are curated and either get upvoted or downvoted by the community. The platform also allows commenting, so each thread comes with relevant discussions about each app. 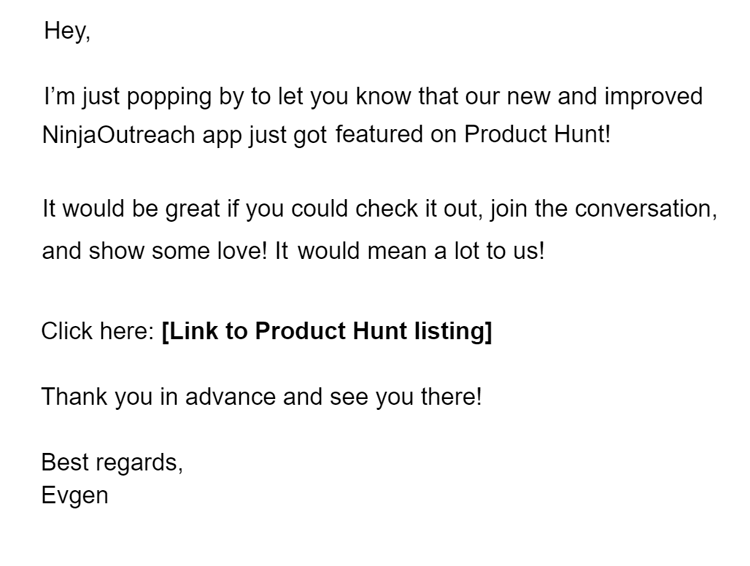 Members who post app recommendations are called product Hunters, so to post an app is to “hunt” it. App developers are called Makers, and they can also hunt their own products. 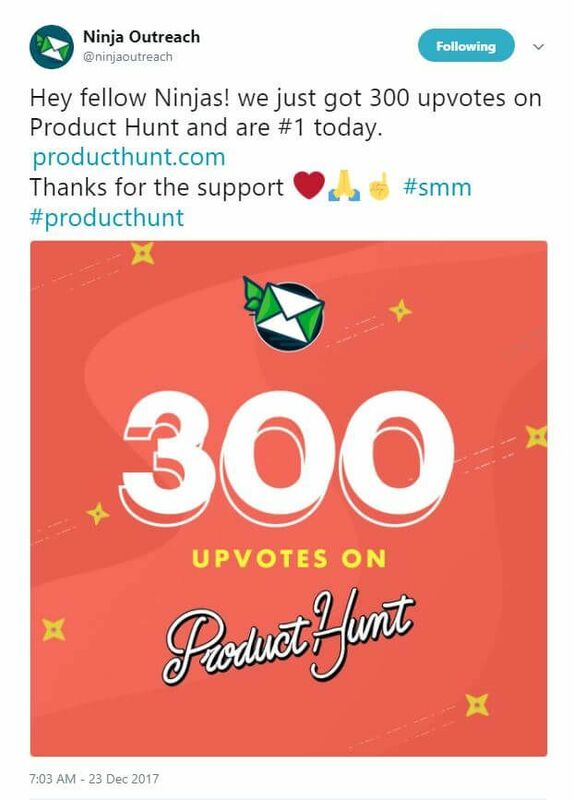 Aside from typical audience engagement and upvotes, Product Hunt has its own algorithm which determines how an app gets ranked and whether it gets featured on the homepage. In a moment, we will share a detailed step-by-step guide to our product marketing strategy. But for the impatient, here is a snapshot of the product marketing tactics we used to generate buzz for the app. As Dave mentioned in his Reddit post, social media buzz was key to our product marketing campaign’s success. Before we launched, our design team already crafted customized banners reflecting our new brand. Each one was tailored for Instagram, LinkedIn, Twitter, and Facebook. Additionally, we had special “milestone” images designed for celebrating if and when we hit 100, 300, and 500 upvotes. Below is a screenshot of the images we used on our Twitter page. As an app that’s been around for over three years, we’ve accumulated our own loyal bunch of customers and site visitors who were more than happy to support us. To help mobilize these long-time users, our Head Copywriter Daphnie edited the templates announcing our launch along with a section to fill in with the link to our listing. We used Daphnie’s final copy on our pop-up message for returning site visitors as well as in-app notifications for customers logging in. Eventually, we updated these notifications to cover each new milestone that we hit. Daphnie also published our Product Hunt announcement through our weekly newsletter, where we have over 10k subscribers. To widen the reach of our product marketing campaign, everyone in the team went through their own networks to share the news. Here’s Dave’s post on his Facebook. Now that we’ve shared our main product marketing tactics, let’s move on to a more detailed breakdown of how we executed our strategy. 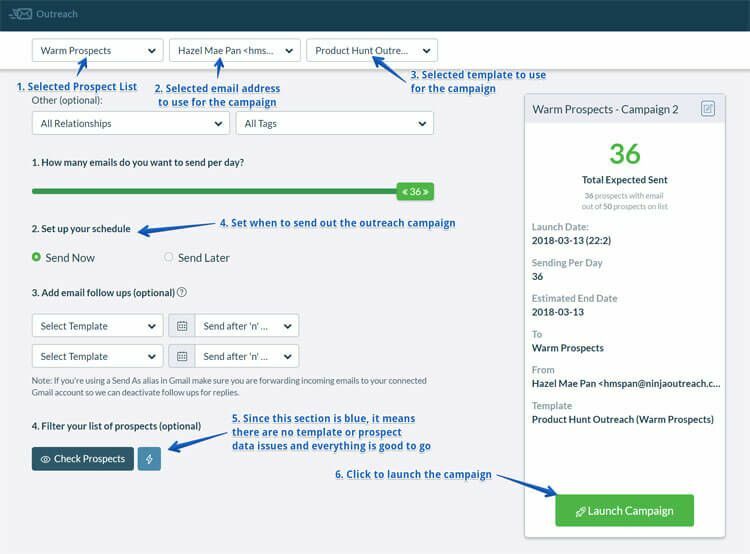 Dave and Evgen organized a list of tasks into a spreadsheet and made this accessible to all the team members involved in the product marketing campaign. Each column contained instructions on what to do, where to store any files involved with the task, who is responsible for it, and a section to indicate the task’s status. To encourage more people to try out our product, Evgen and the product marketing team brainstormed ideas on the best special promotional offer for the launch day. It was a delicate balance between giving a significant discount and not selling our product too short. In the end, the team decided to offer 10% off the first month for new registrations. To make sure that every Product Hunt user will see that offer, we added a banner on the top of our product pages specifically for any visitor traffic that arrived via Product Hunt. A loyal customer base willing to leave glowing comments is a great asset for any product marketing campaign. There’s just no better social proof than those coming from long-time, paying (and happy) customers. So, Daphnie finalized the template for an in-app message to go out to any NinjaOutreach users logging online on our launch day. She also edited other versions of the template so that Evgen can modify our Product Hunt announcements to match the milestones of the day. 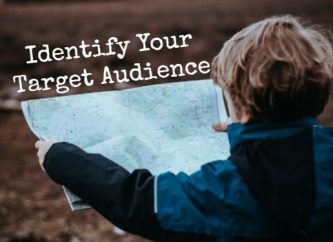 An email list is a powerful resource that you can leverage if you want to promote a product to a warm audience. These are people who already trusted you enough to subscribe to your emails, after all. In our case, we had over 10k subscribers. And for our weekly newsletter, Daphnie edited this template for Dave. Here’s the product marketing template that Daphnie edited for Evgen. And here’s the template that Evgen prepared on Twitter. Since our 2.0 version comes with a new look, we made sure to go back to our old tutorials and update our Knowledge Base with screenshots that reflect our tool’s improved interface and design. A rebranding won’t be complete without promotional media, so our design team got these ready as well. Evgen also prospected some relevant Facebook and Slack Groups where he could join and eventually post announcements of our launch. Of course, he made sure that the material fits the groups’ requirements and that the members already showed interest in getting such announcements. Social media, as we said, is crucial. To make sure we have as many people know about our launch as possible, the team assembled a prospect list of the audiences we wanted to reach out to. 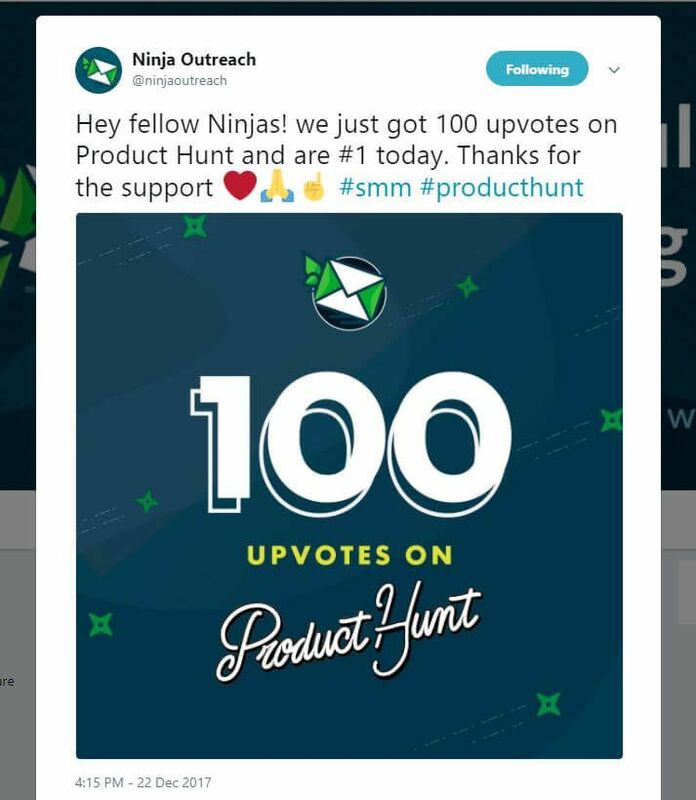 Twitter users who liked NinjaOutreach on Product Hunt previously or liked one of our main competitors. 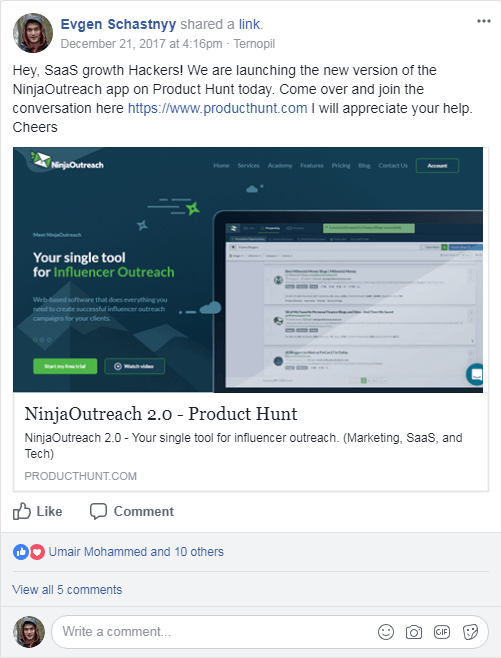 As soon as our Hunter put up the recommendation for NinjaOutreach 2.0, the team was all set. With an organized plan in place, it was easy to get the ball rolling. Our goal was to get our listing up so people can see it as the day starts, so we agreed to have our Hunter post it early. 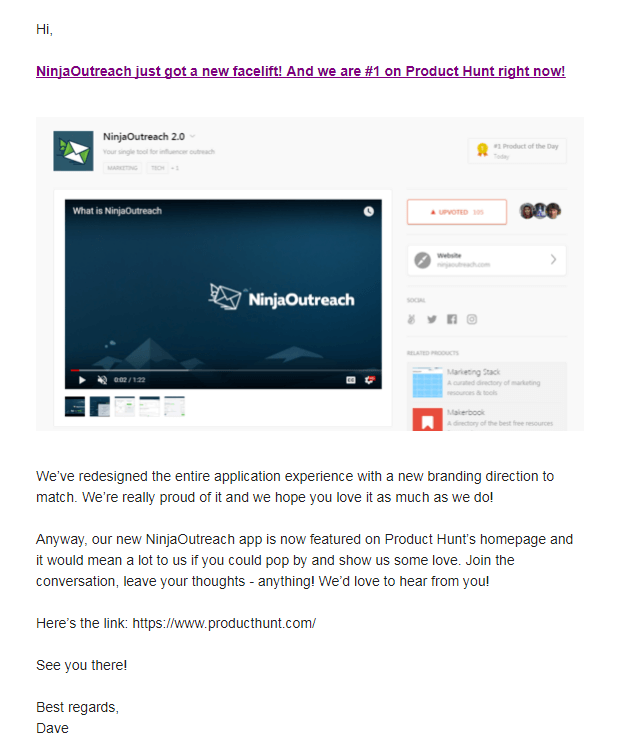 At roughly between 12 am and 2 am PST, our NinjaOutreach 2.0 Product Hunt listing was up. A product launch isn’t complete without the app Maker’s message. 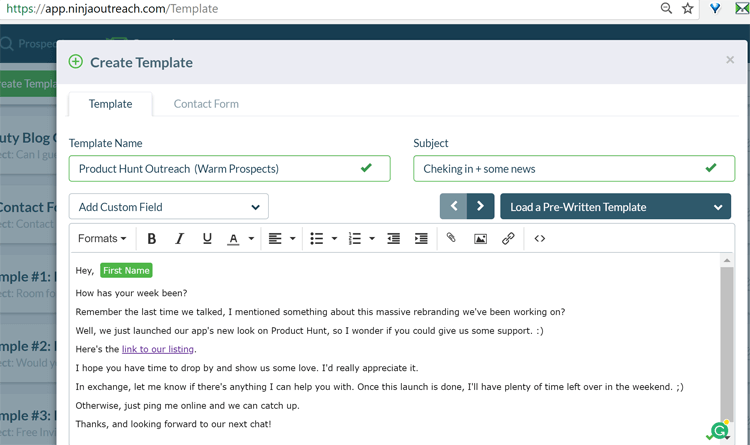 Consequently, Mark posted the template he’d prepared, which discussed NinjaOutreach 2.0’s new look and interface. 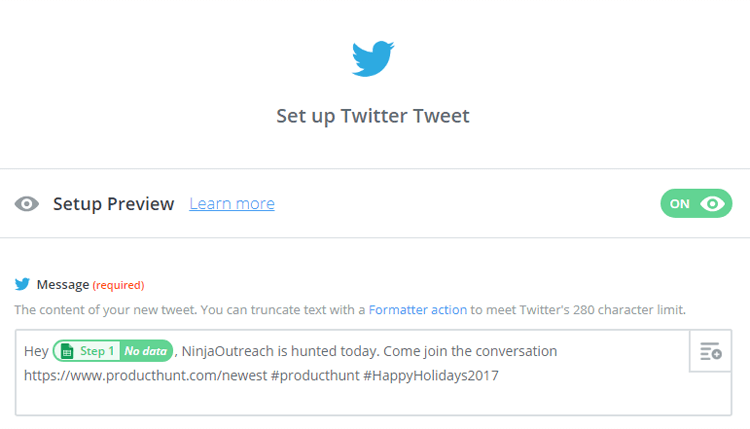 He also shared the details of our special promotional offer exclusive for Product Hunt. A concerted team effort needs constant updates to make sure everyone is on the same page. Hence, here’s Evgen posting an announcement to the All Employees team chat to keep everyone in the loop. Our branded images and Product Hunt announcement captions were all ready as well, so we just set those to go live on all our company social media pages on launch day. We used the same template for our Facebook and Instagram announcement. 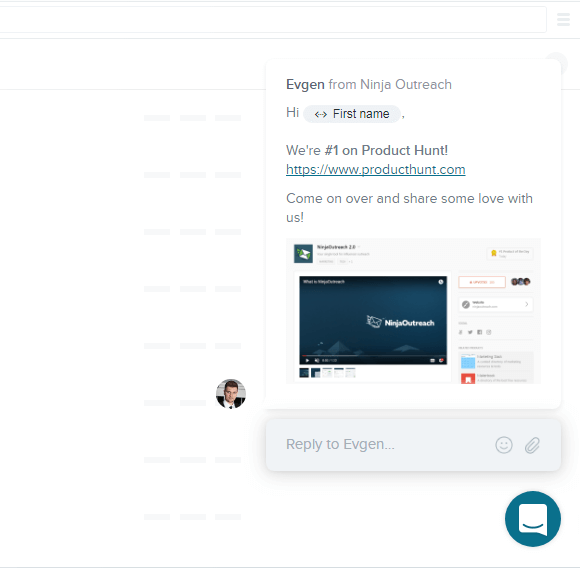 At this point, Evgen also asked other team members to update their social profiles and help spread the news on their networks. After having spent some time building rapport with his Facebook and Slack communities, here’s Evgen in one of his groups announcing our Product Hunt launch. We also shared the announcement via Email, Skype, and other mediums to contacts we’ve had recent or ongoing conversations with. Since I continuously maintain a personal list of contacts that I have a good rapport with, I just opened my account and imported this list to NinjaOutreach. Once done importing, I saved these contacts into a new prospect list for this particular campaign. Because I’ve been in steady conversations with the people on this list (I move any lapsed conversations to another list), I pretty much know the right approach to use in my outreach. I wrote my message naturally, then hit Save to store my template. With my template done, I went back to the Outreach tab then clicked Autosending > Schedule a Campaign. Next, I selected the correct list for our product marketing campaign, the email address I preferred to use, and the name of the custom template that I had just saved. 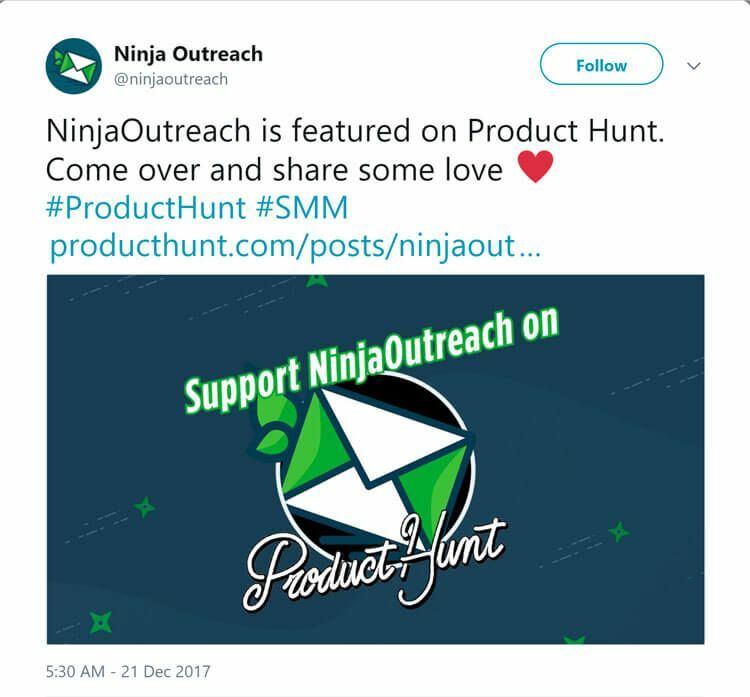 There are ways to pre-schedule a campaign on NinjaOutreach using the Send Later option, but because my template required the link to our listing, I had to wait for us to go live on Product Hunt first. Once our Product Hunt thread went live and I was able to insert the link into my template, I then chose the Send Now option. With all input fields covered, I clicked Launch Campaign and just let NinjaOutreach do its job. An email outreach tool may be less appealing compared to some dating or cat GIF curation apps out there. Still, that didn’t stop us from creating our own hype. Here’s our celebratory Tweet for when we reached our first hundred upvotes, for example. We also used the same template for our Facebook post. Things got even better when we reached 300 more upvotes, so we loaded up our celebratory Tweet for that as well. Again, we used the same template for our Facebook post. Finally, the best moment came when we hit #1 on the Product Hunt homepage. Evgen and the rest of the product marketing team were ecstatic, and we gladly used our celebratory templates for this special achievement. Here’s our Facebook post to commemorate the milestone. TopHuntsDaily, a Product Hunt Twitter bot, already made the announcement for us on Twitter, so we just Retweeted that. 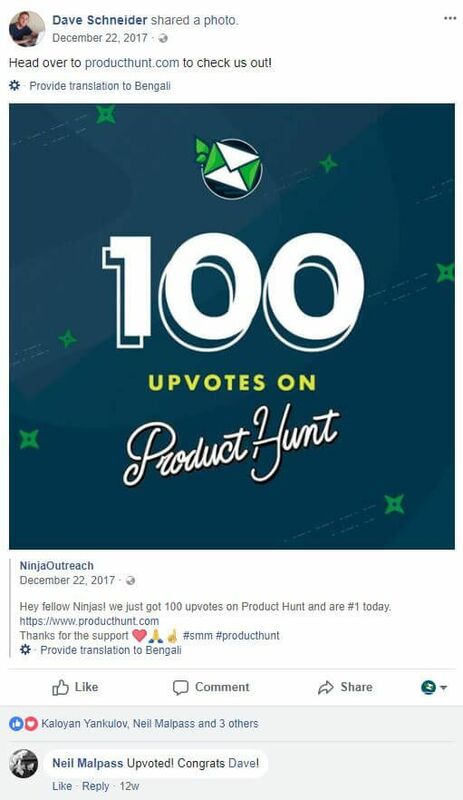 Product Hunt discourages anyone from directly asking for upvotes, so we simply shared the word with our branded images and a link to our product listing. We also made sure to stay within Twitter’s direct message and Tweet limits. 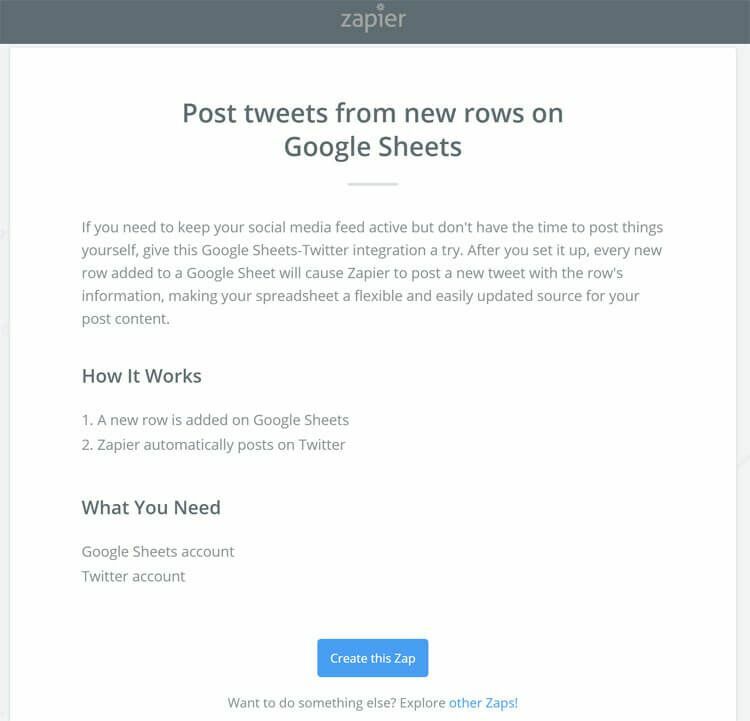 To accomplish these faster, we used an app called Zapier to do a Google Sheet + Zapier + Twitter integration. Basically, Zapier connected the different apps we used and automated the process of turning our templates in Google Sheets into Twitter posts. To demonstrate, here is a look at my Zapier account. 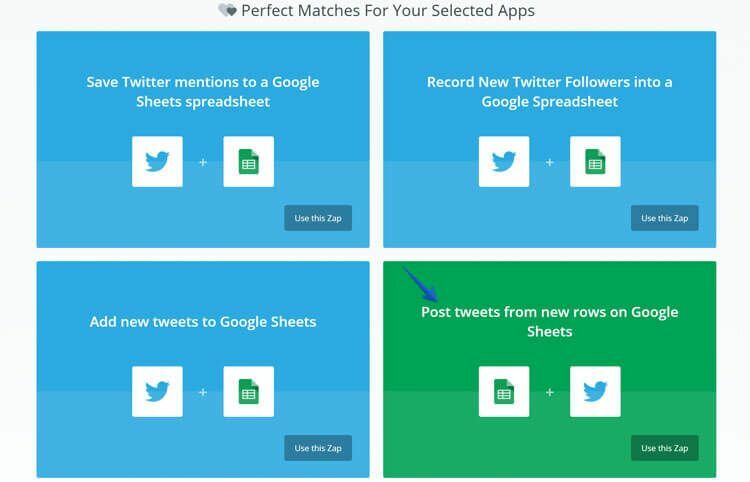 I already clicked Google Sheets and Twitter to view any available zap templates for those apps. 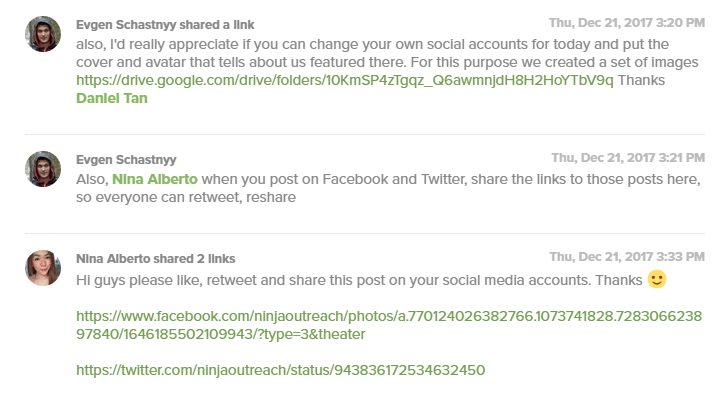 As you’ll see, you can also use zaps to save any Twitter mentions and followers into a Google sheet too. But for this particular task, the zap we needed was the one that made it possible to post Tweets from new rows on Google Sheets. After choosing a zap, Zapier will show a short description page about it so users can double check that it’s going to do exactly as intended. 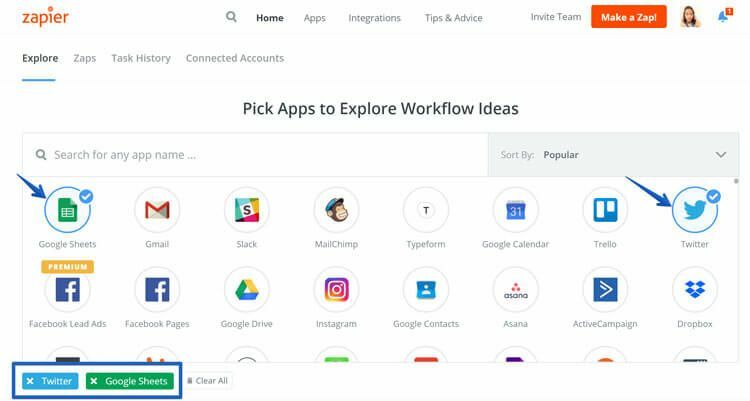 The next steps of the in-app walkthrough are easy enough to understand and in a few minutes, you’ll have a working zap. So, back to the campaign. We integrated several Twitter accounts of some of our team members who have a good following and set these to Tweet around 10 messages each. Those who upvoted competitors and similar apps. All things considered, we still needed to keep the engagement going to maintain our top homepage position. Using our other social media accounts, we also continued to share our Product Hunt link to our personal and business contacts, asking them to support us and join the conversation. Also, some team members stayed on for the whole day of the launch to reply to any mentions and comments on Product Hunt and other channels. After the launch, we rechecked our social media channels to say thank you to all the people who upvoted and shared the news. Evgen personally reacted to all the Tweets to show his appreciation. With our product marketing event done, we disabled all the automated messages we sent to our users and website visitors through Intercom. From #1 on the Product Hunt homepage, we ended the day at #2, with a total of 470+ upvotes, 31 reviews, and 21 comments. 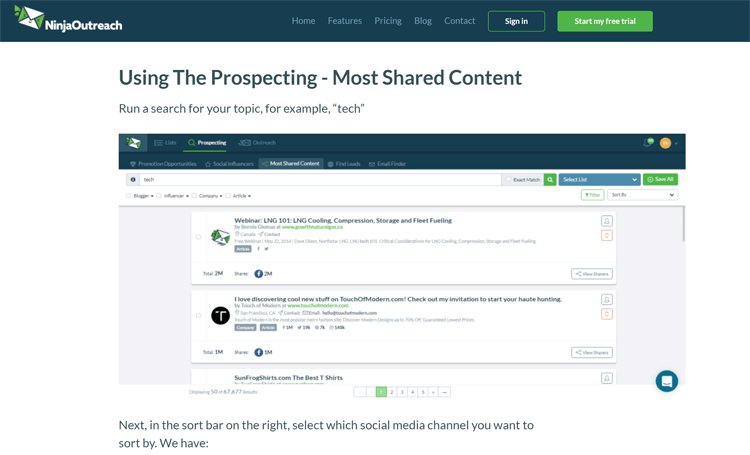 Despite not being able to hold the #1 spot through to the end, NinjaOutreach still gained some leads from this exercise. 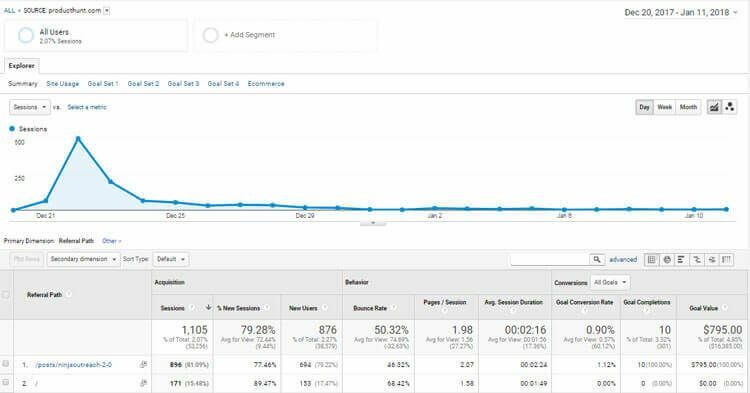 For one, in three weeks after our Product Hunt launch, we’ve received over 1.1k visits and 10 new signups from this source alone. Two months later, our total goal completions referred by Product Hunt reached almost $900. We even got a couple of new business collaboration proposals. However, that’s not to say it couldn’t have gone better. Yes, a social influencer outreach app could not possibly demand the sort of viral engagement that other cooler, more consumer-oriented apps could. Still, we should have gotten more signups. 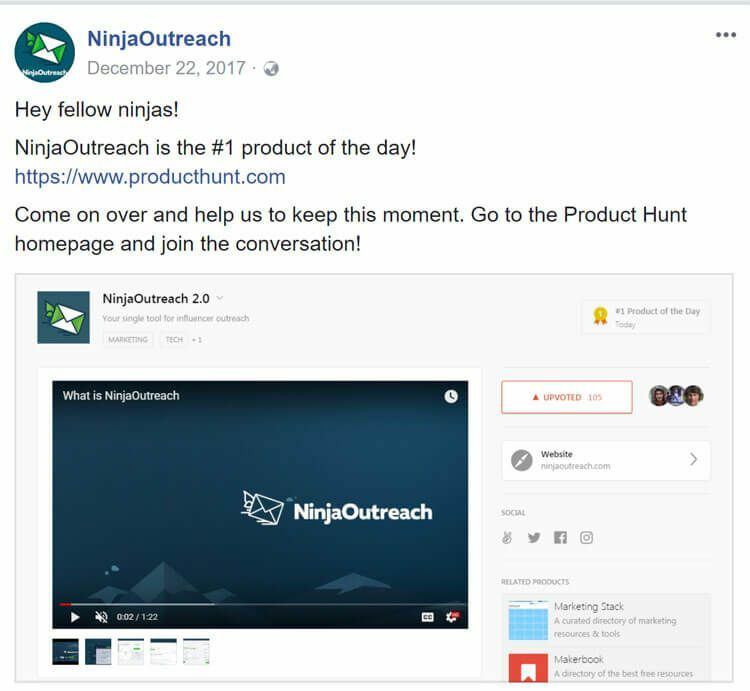 But given that we were able to successfully promote our rebranding with a small team, using minimal time, and with a low-cost product marketing campaign (this only cost us more or less $300 to execute), this, to us, was a pretty good first step for NinjaOutreach 2.0. And as we push through the year with new key leaders to our team, the future continues to be ripe for more opportunities to take NinjaOutreach even further. Hazel Mae Pan is Content Manager & Copywriter at NinjaOutreach. GetResponse vs iContact: Which is Better? 6 Steps to Create Better Customer Service Culture?